“Listen to him, do what he recommends, and you’ll get your sheep.” That was the advice I got over the phone from Fred Gonzalez, owner of Northern Outfitters. Moreover, two of the other referrals I checked with said the same thing, almost word for word. Clearly, on any sheep hunt, those would have been powerful recommendations for Tony Russ, the Wassila, Alaska guide I was considering. What was more remarkable was that these referrals knew I was going to be hunting with a bow, not a rifle! On the other hand, Fred and the others merely verified what I’d already suspected. After all, Tony has taken nine Dall rams, the last five with his bow. 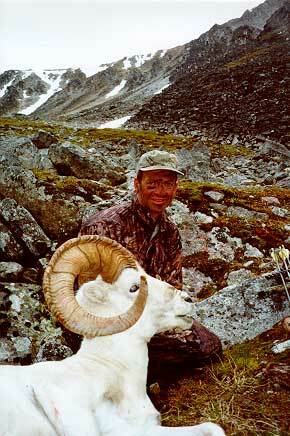 His first archery ram, taken in 1988, still stands as the World Record Pope and Young Dall Sheep. Two more of Tony’s rams are in the Top 20 P&Y, and all five score in the Top 100. Fortunately for me, Tony still had an opening left for the 2000 season, so I eagerly booked the hunt with him. By the time the Super Cub landed in the Alaskan wilderness, on a Wednesday in mid-August, I was as prepared as I felt I could be. Since the first of May, I’d shot over 7,000 arrows, and had added numerous long, steep hills to my regular running regimen. Although I’d never done any backpacking of any kind, I was pretty confident that I would handle the physical part of the hunt with relative ease. After an easy two-mile trek, we set up a temporary camp, then hiked a short way up a big side canyon and started glassing for sheep. It didn’t take long for Tony to spot three rams a couple of miles up the canyon, but those were the only rams we spotted. The next morning, we set out fairly early up the canyon, heading for the top. Our strategy would be to hunt from the top, working carefully along the canyon rims to glass for sheep. Well before we got to where we’d located the three rams from the day before, we cut up a side canyon so as to stay out of sight. Two hours of scrambling carefully over slippery rocks and loose tundra, put us at the top, where we set up camp. Shortly after noon, we began hunting, hoping to find a legal, full curl ram. Within an hour, Tony spotted two rams not far below the rim, but neither ram was quite legal. Later that afternoon, however, we found the three rams we’d seen the previous day. One was a real fine ram, but the other two weren’t quite full curl. We were easily able to get to within 250 yards, then evaluated the situation. There didn’t appear to be any way to get within bow range, so we could only watch them for several hours, hoping they’d move to a more opportune spot. As it became apparent they weren’t going anywhere, we called it a day and headed back to the tent for a freeze dried supper and bed. Friday morning found us again working the rim of the canyon, and by mid-morning, we’d found the three rams again. Unfortunately for us, they’d gong all the way to the bottom from where they’d been Thursday, and were now several hundred yards below us. We watched them for a couple of hours before they bedded down. At the same time, a persistent rain began, which turned occasionally to snow by mid afternoon. Tony and I thus spent a rather miserable and boring day alternating between crawling under a big rock to stay warm and dry, and keeping an eye on the rams, lest they move. By 6 p.m., we bagged it and once again returned to the tent. On Saturday, we found the rams almost exactly where we’d left them. However, we both silently feared they’d again spend the day at the bottom. Playing the optimist, I suggested to Tony that I thought they might move up the far side of the canyon to bed. “If they’ll work their way up those rocks,” I said, (not really believing it myself) we might be able to get close enough for a shot.” To our delight in about an hour, they very slowly started precisely in that direction. “Let’s go,” Tony urged, and we quickly headed off around the end of the canyon towards the far side to get above them. When we got on the same side as the rams, we had some trouble spotting them again, but finally Tony picked them up, bedded down below some rock outcroppings to our right. Luck and the terrain was with us, and with Tony leading the way, and eyeing the rams from a time ?? ?, we soon were within 100 yards of them. Ever so carefully, I quietly moved into position, then cautiously peered around the big rocks that hid me. There, bedded down on the green grass below me, and looking the other way were two gorgeous rams! Where was the third ram? The one on the right looked to be the shooter, but as a first-time sheep hunter, I was deathly afraid of shooting the wrong one. And I knew two of the three were just a tad shy of being full curl. I quickly headed back to Tony, who kept telling me there were three together, and to shoot “the one on the right!” But when I got back to the rock, I could still see only two rams! Was the missing ram to the left of the two rams behind the rocks, or was he to their right and just over a slight rise out of my sight. I’d ranged the best of the two but was still not certain if he was the ram I was looking for. I again signaled Tony as to my dilemma, which caused him to quickly come down toward me. As he peered around the rock, he excitedly mouthed, “That one!” Finally, that told me that, from his angle, he could only see one of the rams, and that it was the one I thought was the bigger of the pair I could see. Despite all the practice during the summer, I was ill-prepared for the shot I was going to have to make. With my feet precariously balanced at different angles on the edges of two slippery rocks, I drew, aimed carefully, or so I thought, and released. To my horror, my arrow passed an inch or two in front of the ram’s chest! Luckily, the rams were confused by what they’d heard, and thought they stood up, they did not move, and continued to look below them. Fortunately, my second arrow, though not a great shot, connected solidly, passing through the ram and generating significant blood flow. The ram headed down the side of the canyon, then bedded. In the treeless tundra, spotting him again was easy, and I was able to sneak up on him from behind a big rock and put down for good from just twenty yards. Just how good this ram was became apparent on Monday, when our pilot, Carl Brent, was able to fly in to pick us up. 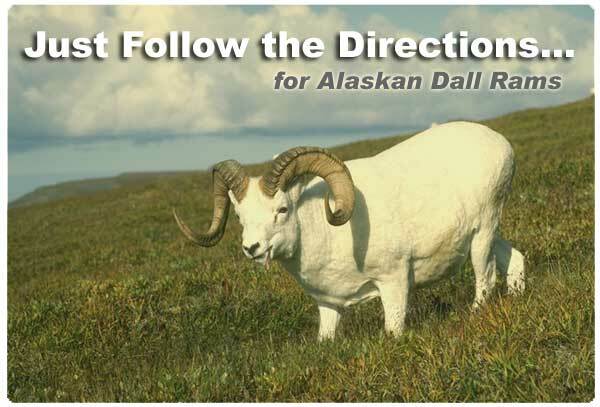 Carl is an SCI master measurer, as well as a member of the Pope and Young Dall Sheep scoring panel. After we had dinner at Carl’s home that evening, he scored the ram @ 161.1/8” SCI, with 14” bases on both sides, and 39.4/8” and 39” horns. After the 60 day drying period, Carl scored the ram officially at 159.4/8”. His bases had dropped to 13.7/8” each and his horns were scored at 39.4/8” and 38.6/8”. Based on the official Pope and Young records book that was published in 1999, this makes by ram #15 all time!